A medium-sized retriever, the Nova Scotia duck tolling retriever is a hunting dog that is used in a most unique manner. Instead of sitting steady in the duck blind and waiting for the gunner to drop birds, the toller is an active participant in the hunt. While the hunter remains hidden in the blind, tollers work the shoreline, darting in and out of the brush. Waterfowl, their curiosity piqued by the motion and the flashing white patches on the toller’s reddish coat, come closer to investigate. At that point, the hunter rises from his hiding spot, causing the ducks to flush. After the gunner drops the birds, the toller swims out and retrieves the waterfowl and delivers them to the hunter’s hand. Originating, not surprisingly, in Nova Scotia, Canada, the toller was developed in the early 19th Century. It’s the smallest of the retriever breeds and is often mistaken for the more common golden retriever. The origins are unknown, but likely consist of a red decoy dog of some sort brought to the new world by settlers and then mixed with spaniel, setter and retrievers, as well as perhaps some type of collie, according to the AKC. It was originally known as the Little River Duck Dog and the Yarmouth Toller after the district of Yarmouth County in Nova Scotia. Tollers are intelligent, alert and active dogs that love to work and do well with children. They top out at 21 inches in height and 55 pounds. While their small size might make them attractive to apartment dwellers or those with a small yard, you have to remember that the breed was developed to hunt and requires sufficient exercise and mental stimulation. Excepting the unique way in which tollers work while hunting, perhaps their most distinguishing trait is their coat. It can be any shade of red, which can range from golden red to deep copper – the medium-length featherings are usually lighter in color. Tollers usually have at least one white marking on either its tail, feet or chest. As retrievers, they should posses double coats – a soft, dense undercoat that keeps them warm and insulated and a water-repellent outer coat that helps repel icy water when they retrieve waterfowl. Health wise, tollers suffer from a few genetic issues, which are compounded by the fact that the breed suffers from a small breeding pool – reportedly, they’ve lost approximately 90 percent of their genetic diversity. 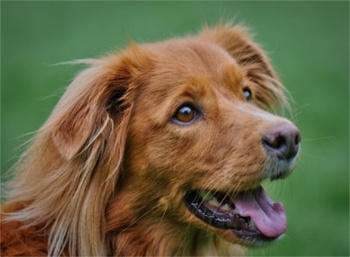 At Paw Print Genetics, we offer a panel test that screens for three genetic mutations in the Nova Scotia duck tolling retriever. Those test include collie eye anomaly, degenerative myelopathy, progressive retinal atrophy (rod-cone degeneration).